NEW YORK, NY--(Marketwired - Apr 17, 2017) - Delta Children, a leading manufacturer of furniture for babies and children, today announced it recently signed its first licensing agreements with Warner Bros. Consumer Products and Entertainment One. The partnerships will bring popular television show characters to new lines of toddler and juvenile furniture launching as soon as this year. Through the deal with Entertainment One, a leading international entertainment company, Delta Children became an official licensee of pre-school phenomena "PJ Masks" and "Peppa Pig". Kids' furniture lines for both brands will launch later in 2017 and include beds, upholstered chairs, table and chair sets, as well as toy storage. Delta Children also became an official licensee of the popular Warner Bros. superhero brands Batman, Wonder Woman, Justice League and DC Superhero Girls. Juvenile lines for each license are currently in the early concept stages. "We're proud to further expand our licensing partnerships by collaborating with these two companies that have some of the most popular characters in children's entertainment, as well as to continue demonstrating our leadership in the space," said Joseph Shamie, president of Delta Children. "Our licensed products provide children with new ways to engage with characters they admire from their favorite television shows, and challenge the limits of their imagination." Justice League members for which Delta Children has licensing rights include Superman, Batman, Aquaman, Green Lantern, The Flash and Cyborg. Delta Children's DC Superhero Girls license comprises the characters Wonder Woman, Batgirl, Supergirl, Harley Quinn, Katana, Bumblebee and Poison Ivy. "Delta is the go-to company for licensing popular characters for children's furniture," said Jennifer Snyder, vice president of licensing at Delta Children. "Whether purchasing a single piece or a complete collection, our products transform a room and make any child feel like the star of their own story." The Shamie family founded Delta Children more than 40 years ago on the premise that every family should be able to afford a safe crib for their baby. From day one, Delta has been known for safety and innovation in its cribs, strollers and other children's products. Delta sells more cribs than any other brand worldwide. Whether for infants or young teens, every safe, high-quality Delta product is crafted to deliver timeless design, outstanding value and myriad uses for years to come. For more information about Delta Children, please visit www.DeltaChildren.com, Facebook.com/DeltaChildren or Twitter @DeltaChildren. 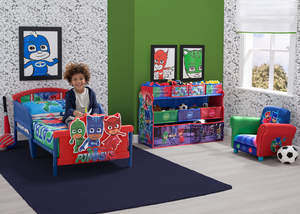 Delta Children furniture featuring characters from the popular television show "PJ Masks"